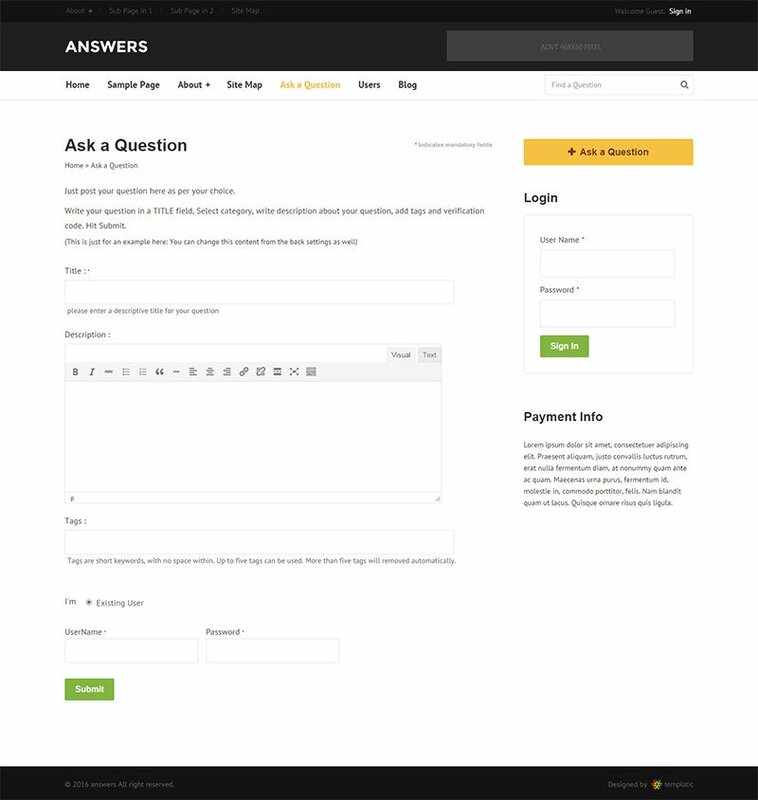 Ask a Question form is an integral part of any Q&A site so we took special attention to it in Answers. Add the title, description, category… it’s all there. Set a price for submitting a question and provide your PayPal ID. 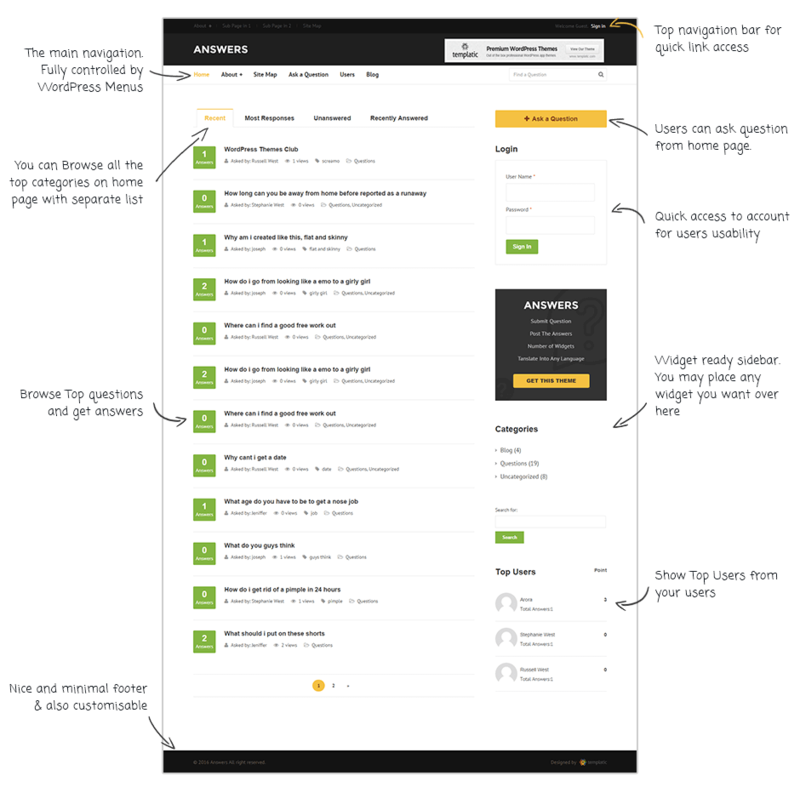 The theme will automatically charge users who wish to submit a question on your Q&A website. Both you and your visitors can vote on providing answers. The total score for each answer will be clearly displayed so new visitors can easily spot good answers. 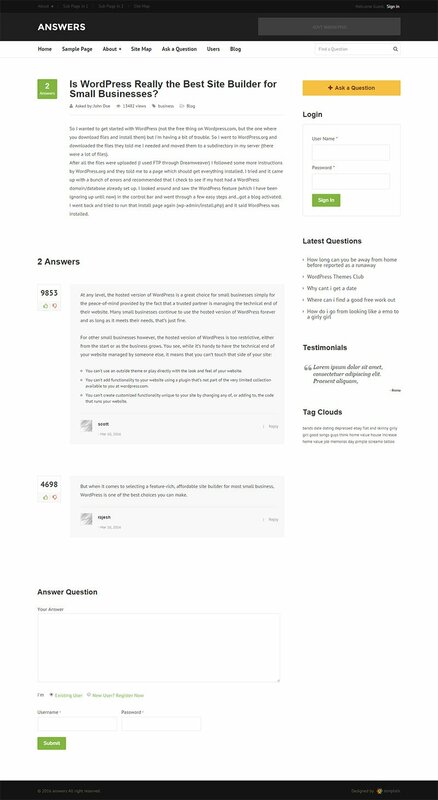 In Answers theme, the admin and the question starter can assign a comment as the “Best answer”. This answer will then be highlighted and different from the rest. 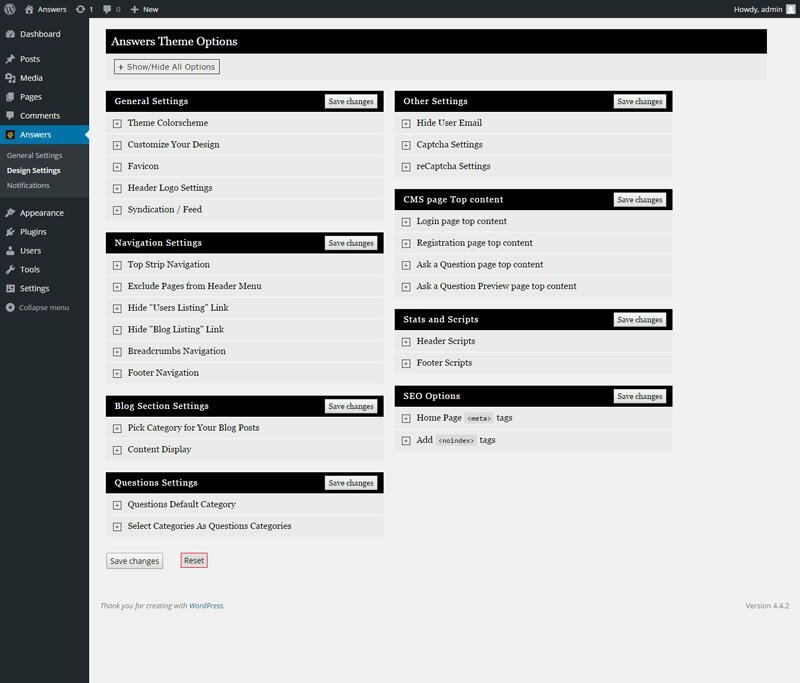 Many parts of Answers are widgetized allowing you to change content quickly. 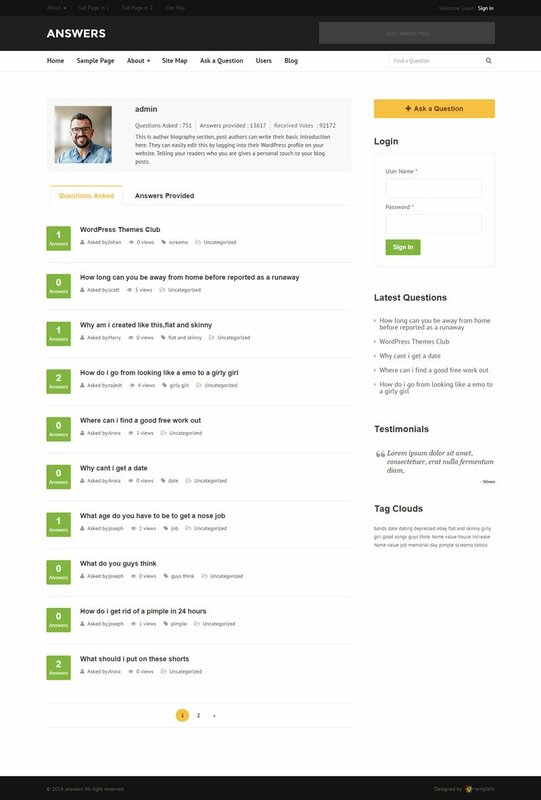 There are also separate sidebar areas for the homepage, inner pages and the Ask a Question form. 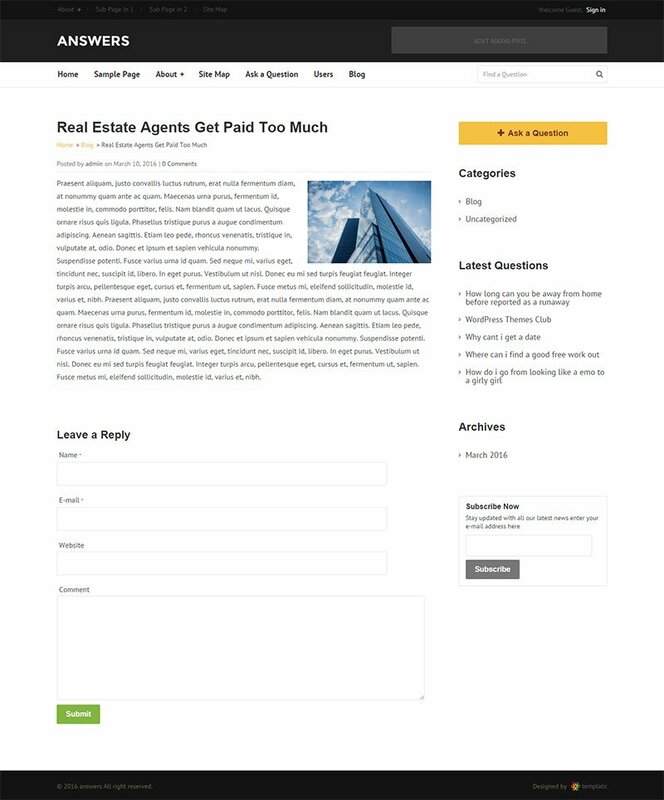 Helping you structure your knowledge base website and display content are various widgets. These include: Header Advert, Loginbox, Subscribe, Testimonials, Top Users and more. 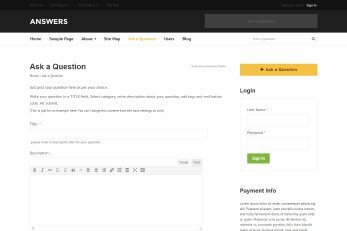 Wondering how to create a Question and Answers site in WordPress? We have the perfect, easy and affordable solution for you. 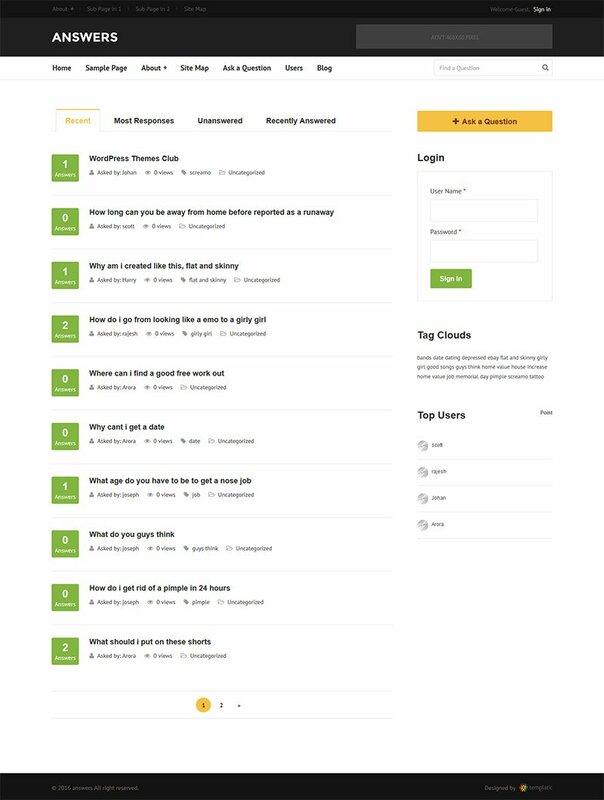 Answers comes with all the tools you need to start your very own Q&A portal like Yahoo, Quora or Stack Overflow in minutes. 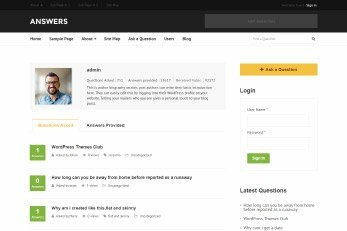 Answers is one of the most powerful and best questions and answers WordPress themes available today. 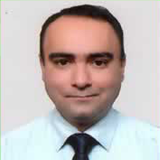 It allows you to create a fully functional Q&A portal that is user driven and content oriented. 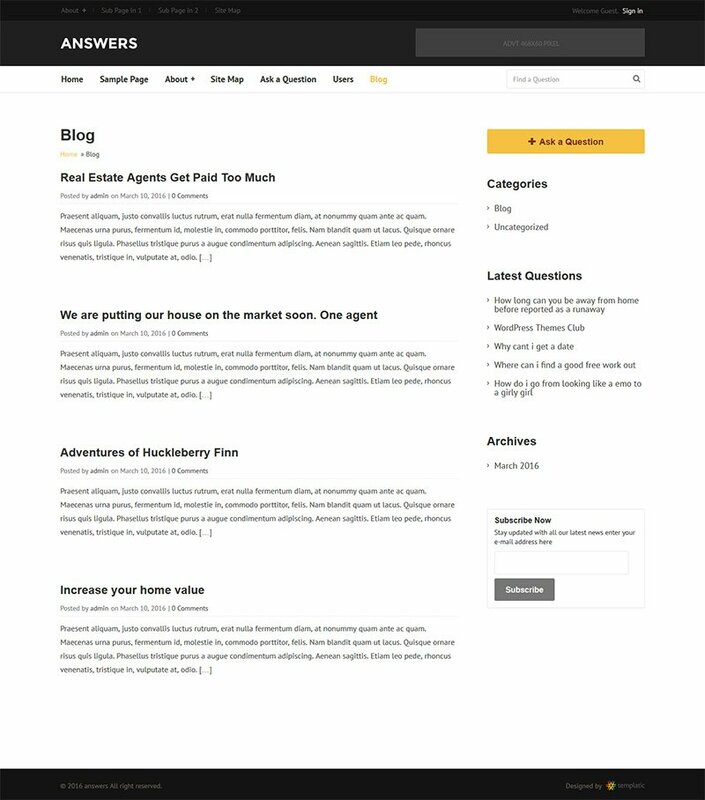 This focus on content is visible in the design itself with the homepage being dominated by the big questions section and easy to find ‘Ask a Question’ button to encourage more content on your portal. 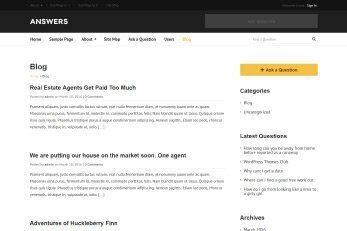 The Answers theme is responsive so no matter if your users visit your portal from desktop or mobiles, it will look great. 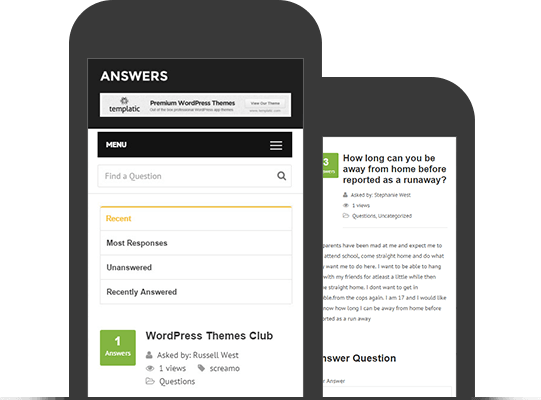 This question and answer engine is designed to look great on all mobile devices such as smart phones, touch pads, laptops. It is coded to look great everywhere. 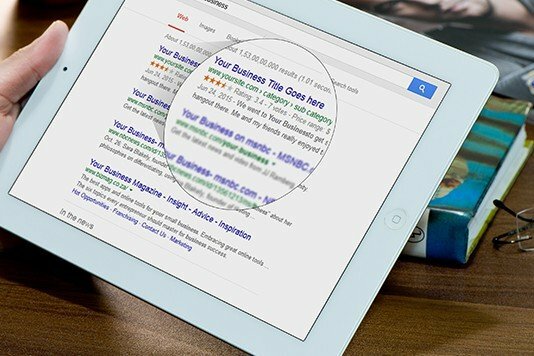 This means your Q&A website has a lower bounce rate, better position in the Google search results. 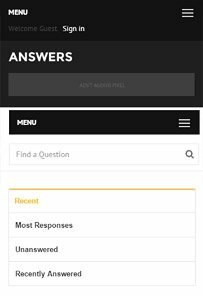 Please feel free to visit the Answers theme demo from your mobile to see how it looks. 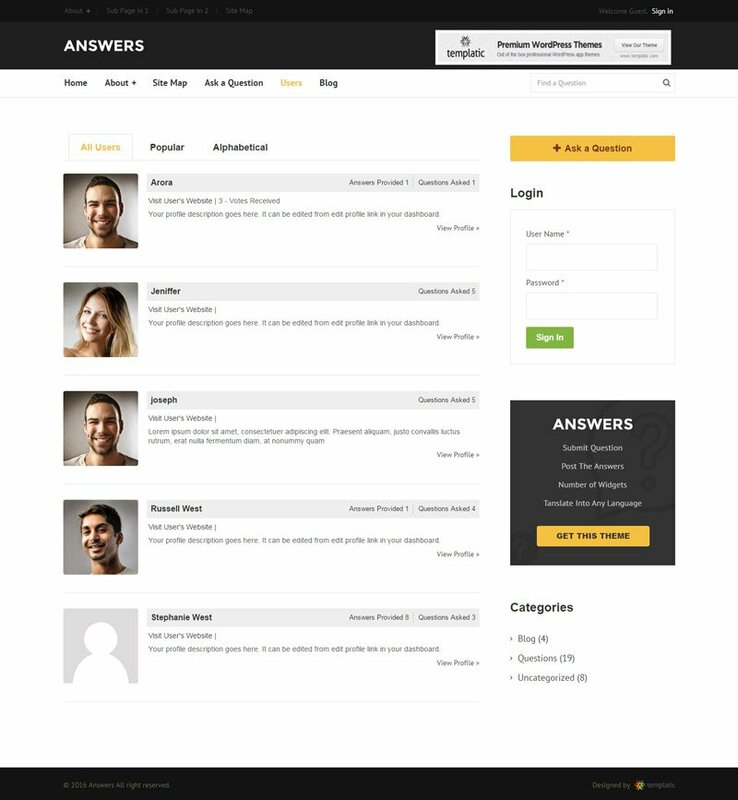 As well as customizing the question categories, give your questions and answers website the look you like. 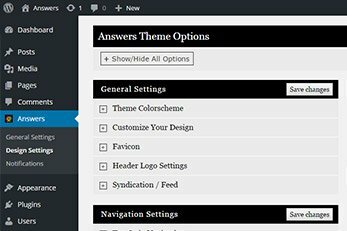 The Answers theme comes with many color schemes to let you globally change its colors. Translate Answers into any other language and change the currency. 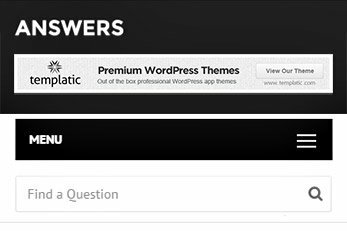 This popular question answer WordPress theme is SEO optimized and coded with best of SEO practices. 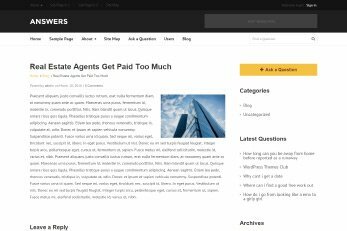 Not only that, this question and answer script also supports the best, free SEO plugins such as Yoast SEO, All In One SEO, Google XML Sitemaps and All In One Schema.org Rich Snippets . With good content, your questions portal is guaranteed great traffic.